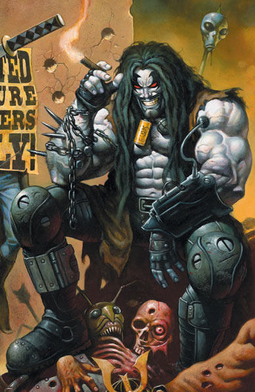 Lobo, in promotional cover art for Lobo Unbound #1, by Alex Horley. 388x size unsuitable to use for high end reproduction. Lobo (DC Comics): For identification purposes in conjunction with discussion of the topic of the article. No free use image available. All DC Comics characters and the distinctive likeness(es) thereof are Trademarks & Copyright © 1935-2019 DC Comics, Inc. ALL RIGHTS RESERVED. qualifies as fair use under United States copyright law. Any other uses of this image, on Wikipedia or elsewhere, may be copyright infringement. See Wikipedia:Non-free content and Wikipedia:WikiProject Comics/copyright for more information.